Bonkers. Utterly bonkers is the only way to describe Let's Get Practical! Live. Presented by The Very Good Looking Initiative (which brought us last year's CULL), this show is absurdist humour at its core with the usual dose of high-octane energy that comes with a TVGLI production. Australia's most popular late-night chat show Let's Get Practical! is being performed live for the very first time. 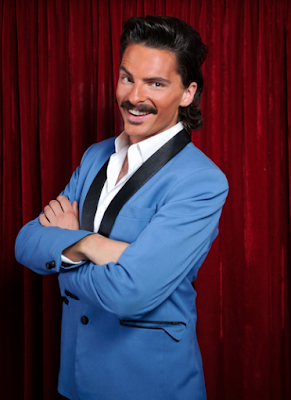 Our host is the tanned, charismatic and seemingly confident Elliott Gee and along with his two audience warmers, Honor Wolff and Patrick Durnan Silva, they successfully work the crowd into a frenzy with promises of non-stop entertainment, games and guests. But this is live television where you can't get a do over if something doesn't go according to plan, say for instance, if your host freaks out as soon as the cameras start recording and rushes backstage leaving the audience staring at an empty stage. I have never laughed so hard than as I have with what happens next and it is testament to Gee, Wolff and Durnan Silva's skill and awareness in what they are creating, and knowing not only what will get them laughs but also how to sustain the laughter. There are a few times where the comedy doesn't quite hit the mark - in concept and duration - but even in these instances it is fascinating to see how they continue to up the ante and being witness to what they have conceived. The uneasiness and uncertainty is accentuated by some impressive sound and lighting design by Tom Backhaus, and you begin to feel that you are in a Lynch-esque nightmare where the performers have taken too much acid - but all in a good way. The Very Good Looking Initiative's Let's Get Practical! Live is an an absurdist look at anxiety and the horror that we can often get trapped in, and is an impressive follow-up to CULL. Their style of humour and ideas are unique and original and I can't think of any other company or individual in Melbourne that is doing this style of comedy and theatre as well as this. Venue: Lithuanian Club, 44 Errol St, North Melbourne.